Please visit our picture gallery to live the FERSA difference. Unique solution by means of such physical dimentions and requirement of no extra connections to computers, DMX or similar control boards . Requirement for optimum sized installation volume has been achieved by a compact control unit as a regular wall switch. The Flexi Plus system is very simple programmable solution that gives chance to prepare desired colour easily. Capable of controlling both RGB florescent and LED based systems including especially power LEDs with same system. 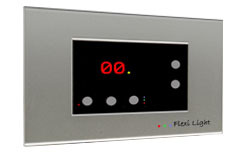 Visually controllable dimming range between 0 to 100% preciously with the accuracy of 1%. The system gives chance to set 10 different desired colours. You can set one of these preset colours to be displayed permanently or with delayed cycles from 0 seconds to 99 minutes. According to the chosen flourescents and LEDs, this system can control up to 60 luminaries, which means for flourescents up to 180 pieces.